Sabang is a city consist of several islands with tourism object which still very awake its naturalness,start from the mountain, lake, beaches, sea, coral reef, also its forest is still looks very natural. The natural impression is deliberately kept as a valuable object of that region. 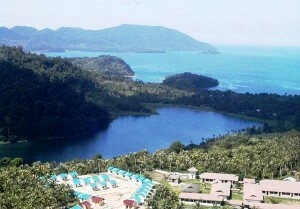 Sabang has an area of ​​156.3 km ² with the highest peak at 617 meters above sea level. Sabang town before World War II was the most important port city compared by Tamasek (now Singapore). But after status Free Trade and Free Port repealed in 1985, this place became deserted by ships and visitors. Even after returning proclaimed that Sabang as Free Trade Zone and Free Port in 2000, it still can not restore the image like before because Singapore as its closest rival is now very advanced in terms of facilities. The Zone of Free Trade and Free Port was closed back in 2004 because at that time, Aceh was designated as an Area of ​​Martial Law. But it doesn't mean that Sabang is dead. Sabang is now resurrected with a new face, as a marine tourism region that must be reckoned in Southeast Asia, even the world. A meeting place between the Indian Ocean and the Strait of Malacca, an area with hundreds of species of fish, a sea area with rich natural reefs (instead of planting / cultivation), and a region which proud of their green image. For the experienced snorkeling enthusiasts, octopus and stingrays can be found here. Basking under the sun on the beach with fine and white sand can be done in the adjacent beach. This place is a paradise for tourists who like snorkeling and diving. Coral reef is only about 5 meters from the sandy beach. The accommodation in the form of food and lodging are available in Iboih Village. Iboih is a small village where the conditions and the services which is provided by the local residents is strongly support the convenience of enjoying the surrounding of natural scenery. Iboih forest is located adjacent to Rubiah Marine Park, with an area of ​​about 1300 acres, and is also a protected forest area. This forest is a tropical rain forest with the density is still high but always invites by the visitors to enjoy the beauty and its authenticity. This forest is a home for the variety of animals, there are a lot of monkeys, small and large reptiles, and colorful birds including the Nicobar pigeon which is can't be found in other parts of Indonesia. 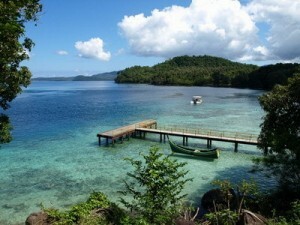 Rubiah Island is a small island with a land area reaches 0,357 km ² which is located approximately 23.5 miles in the west of Sabang downtown and adjacent to Iboh Beach. The Indonesian government has set this sea area, about 2.600 acres around the Rubiah island as a special area of ​​natural reserve. 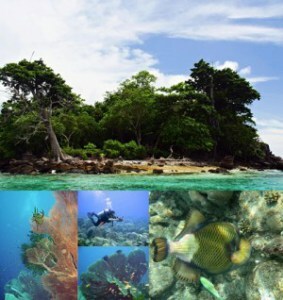 Located in the bay of Sabang, where the water here is relatively calm and very clear (The visibility is about 25 meters) The sea here is filled by a variety of coral reefs and colorfull fishes. Also can be found some gigantic clams, angel fish, school of parrot fish, lion fish, sea fans, and many more. There are several natural caves on the west coast of Weh Island which is located across from Iboih forest. These caves is overlooking to the ocean and inhabited by a variety of birds, bats, and snakes. Exploring this place by boat must be accompanied by the local residents because of its location which is quite difficult to reach, and dangerous, especially between May and September when the West monsoon comes. This condition is very challenging for cave lovers. Aneuk laot in the Acehnese language, which means Son of the Sea. The Lake of Aneuk Laot is located in the middle of Sabang town, with a beautiful panorama to be enjoyed during the day, because it is cool and when dusk arrived we could enjoy a dazzling sunset, and when night comes the light of the lamps from the hill of Sabang city illuminate the lake. This lake is the water source for the entire population of Weh Island. Three wells beach (In Indonesian called Pantai Sumur Tiga) is a beautiful beach located in the village of Ie Meulee, Weh Island. Three wells beaches with the white sand surrounded by amazing scenery. This beach is in great demand by tourists both local and foreign tourists. In addition, many beach sports such as diving and snorkeling is available. Many facilities which is offered make this beach visited by many tourists. The beach isn't less beautiful than the beach of Iboh which is located adjacent. 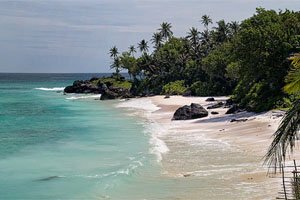 This beach with a beautiful panorama is also ideal for snorkeling sports enthusiasts because they can funnel his hobby at this beach. This area is equipped with several facilities such as hotels and restaurants. And also there is a dive school run by a couple from the Netherlands. 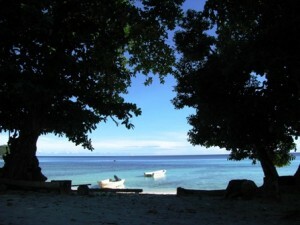 Kasih beach is a beach tourism object in the Bawah Sabang city, just 2 km from the center of Sabang. In this place there is a central of culinary of sabang city. 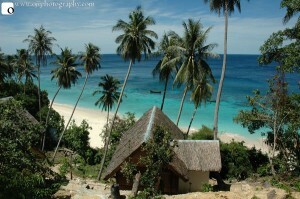 Kasih beach is a rocky beach with lots of palm trees along the peninsula. On the beach also can be found several World War II relics in the form of forts where heavy weapons such as cannons used at the time. There's something incomplete if we went to Sabang before visiting the place on this one, a place which they claim as the most western point of Indonesian archipelago and marked with a monument named The Monument of Zero Kilometre. This place is located in the Forest Park of Sabang and it's about 40 Km west of Sabang city center. In this place we will be pampered with a beautiful natural scenery and panoramic view of the blue sea in the area of ​​the monument, especially before sunset. In addition to 8 places above, there are many interesting places to visit such as Anoe Itam, Beach of Tapak Gajah, Sabang Hill, Peria laot Waterfall, Peak Sabang, Jaboi Geothermal Resources, and many more. 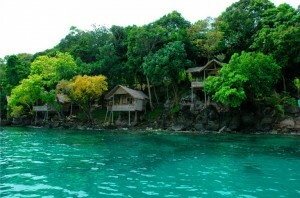 The best place to visit in sabang is Iboh !